Who Is Olivia Green? ($20, 202pp, 6X9″, Print ISBN: 978-1-68114-225-8; $2.99: EBook ISBN: 978-1-68114-226-5, LCCN: 2015919800, January 2016; Purchase on Amazon or Barnes & Noble): Lawyer. Spy. Lover. Fighter. This debut thriller follows Olivia Green as she becomes all these and yet remains a mystery, even to herself. Lawyer: A young associate in a high-powered firm building a fledgling office in Augusta, Georgia. Spy: Recruited in high school to work for a secret organization that was formed after 9/11, an organization tasked with doing whatever it takes to keep the country safe. Their protégé, Olivia, surpasses expectations on her first assignment and moves onto her next mission, an assassination. Lover: From teachers to gym instructors, no man can resist her charm and fierce intensity. Fighter: Shady men lurking in the shadows get more than they bargained for from this CrossFit enthusiast. 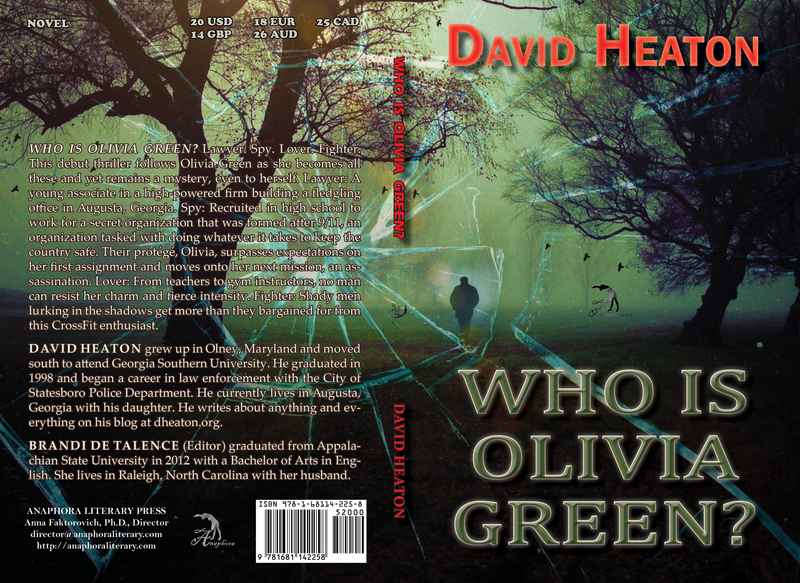 I Am Olivia Green: (Softcover: 204pp, 6X9”, $20: ISBN: 978-1-68114-487-0; Hardcover: $35: ISBN: 978-1-68114-488-7; EBook: $2.99: ISBN: 978-1-68114-489-4; LCCN: 2018965292; Fiction—Thrillers—Political; Release: March 1, 2019): Olivia Green’s life was perfect. Her career was on track. Her relationship with Carlo was going strong. After successfully assassinating a Saudi prince for a secret government agency, Olivia received her next assignment: find out who attempted to import a dirty bomb into the United States. It was all going well until she learned that her adoptive father was dying. Before long, with her secret and unknown past racing to catch up with her, Olivia will find herself in a fight for her life. If she can survive, the truth about Olivia Green will finally be revealed. David Heaton grew up in Olney, Maryland and moved south to attend Georgia Southern University. He graduated in 1998 and began a career in law enforcement with the City of Statesboro Police Department. He currently lives in Augusta, Georgia with his daughter. He writes about anything and everything on his blog at http://dheaton.org. Brandi de Talence (Editor) graduated from Appalachian State University in 2012 with a Bachelor of Arts in English. She lives in Raleigh, North Carolina with her husband.